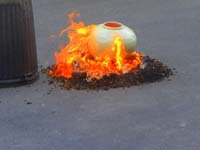 Courtesy photo Raku pottery is fired at Boulder Mountain Clayworks. Boulder Mountain Clayworks has converted an industrial parking lot of asphalt and utility trucks into a beautiful Tuscan veranda with trees and foliage to serve as the escape to the Italian countryside that is the nonprofit organization's annual fundraiser, Tuscany on Tenth. It will be held this year on Thursday, July 5. In addition to the bountiful veranda made possible by Webb Landscaping, there will be tables described by organizers as "fresh out of a Fellini movie" with a unique centerpiece created by Sue Ellen Bridgeman Florist. The event runs from 5:30-8:30 p.m. at Boulder Mountain Clayworks, 471 E. 10th St. Industrial Park just below the Knob Hill Inn. For a $50 ticket, guests will dine on pizza by The Red Oven, sip on wine and enjoy bellinis in the name of embracing the culture of Tuscany. Guests will participate in the 16th-century glaze firing process of Raku. Ceramic pieces will be on hand to paint and fire during the event and be ready to take home that night. There will also be a "Build and Bid" portion during which studio potters Lauren Street and Judi Nickelson will demonstrate throwing pots on the wheel as the guests bid on the pieces as they are being created. All of the studio potters have made pieces for auction, which also will feature top-notch wine, a health and wellness package and a dinner by Judith McQueen. Boulder Mountain Clayworks provides after-school classes for children and teenagers of Blaine County. Classes for adults and families are also offered year round. During the summers, Boulder Mountain Clayworks has sculpture camps for kids, pottery throwing camps for teenagers, guest artist workshops for adults and opportunities for families to bond over the making of popcorn bowls. Tickets can be purchased at Boulder Mountain Clayworks and Chapter One Bookstore. For more information, call the studio at 726-4484.